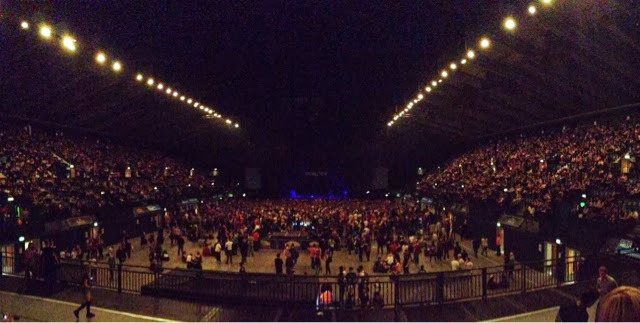 Kirstiekins Blogs: Paramore at Wembley! 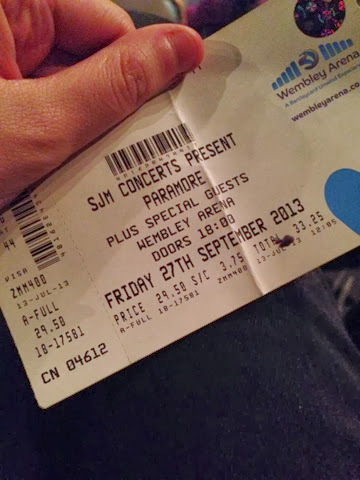 This month has been pretty much a paramore centered month for my blog, considering It started with me seeing them at the iTunes festival a few weeks ago, to getting a paramore based tattoo, bumping into Taylor On Oxford street, and then finally seeing them at Wembley arena last night! I won't go into too much detail as I'm pretty sure you're all sick to death of me proclaiming my love for the band, but I have loved then since I was 15 so I think it's a little bit expected! The crowd were hyped through out the whole thing, including the north seating section who practically stormed the balcony during crushcrushcrush and extra security had to be called to get everyone back to their seats! The best part of the entire evening was when Hayley made a speech saying that "No matter what is going on outside this walls, whatever is going on in your personal life, or in your head, you can get through it. It's just life, and if we can get through everything, then you can too!" I was literally BAWLING at that point! I would give anything to be able to meet her, and just thank her for being so inspirstional! This may seem a little weird, but I am so proud of them, to see how far they have come! Long gone the days of them traveling around in a little van playing small dive bars! They're are now selling out arenas and stadiums and have records gone gold and platinum! Who would have thought that a small group of friends from Tennessee, could grow up and take the world by storm with their music, lyrics, inspiration and coolness! I'm pretty sure you're all getting sick of my posting about Paramore, so I'll be posting about more stuff during the week that cool and awesome and fun! Stay tuned! For more blog posts on Paramore, Check the home page, or click the music link at the top!